If you’re familiar at all with the amazing landscape in Colorado, you know it can vary greatly from one region to the next. While some areas of Colorado boast magnificent mountains and passes, others offer plains and dunes. Many popular areas for 4WD off-roading include trails in southern Colorado near Durango, Telluride, and more well-known scenic mountain towns, along with many great spots in the central part of the state surrounding the Rockies. But the northern half of Colorado is not to be forgotten when planning your next off-roading experience. Below is an overview of six awesome roads and trails in northern Colorado to try on your next off-roading excursion. Each summary is outlined with an encouraged experience level (easy, moderate, or hard), approximate trail length, seasonal access availability, and a brief description of what to expect on the trail. We’ll also give some ideas of camping nearby or other scenic views and places to visit. Buffalo Pass trail is located right outside the town of Steamboat Springs in Routt National Forest. The trail is used not only for off-road vehicles but also for hiking and biking. Buffalo Pass offers scenic views of meadows and aspens and also opportunities for lake fishing and camping. Take the trail up and stop for lunch or a quick hike. Planning on staying the night? Camping can be found off this road at Summit Lake campground (6 tent and 9 drive-up spots) and at Dry Lake (8 camp sites). Both are on a first-come, first-served basis. While this trail is rated easy for OHV use, vehicles with 4WD and a decent amount of ground clearance are strongly suggested. Visitors report nice scenery (and summer wildflowers), though the ride can be quite bumpy. Deadman Road is an easy, scenic trail in Roosevelt National Forest. This is a popular trail near the town of Red Feather Lakes that connects to many other 4×4 roads. Off the trail, explorers can find fishing, camping, and hiking. While 2WD vehicles can be used on much of the road, a 4WD vehicle may be best for the entire trek and for exploring other more aggressive trails in the area. There are many camping opportunities off Deadman Road, but if you’re looking for something different, try staying in Red Feather Lakes. This small recreational town was originally settled in the early 1900’s by loggers and ranchers. It now offers a variety of places to stay (including B&B’s and ranches) and other outdoor and indoor activities to try. Storm Mountain is a fun, moderately challenging (maybe difficult to some) out-and-back trail west of Loveland, Colorado. This trail is a rockier drive up to a scenic view at the top of Storm Mountain. High-clearance vehicles are suggested for most of the route. Along the way, you may pass meadows and other trails. Take a break and find an off-shoot for a short hike or scope out a place to camp if you plan on staying overnight. Overall, the road may be a bit of a challenge depending on the season, but the end result offers amazing views of mountains and meadows dotted with evergreens and aspens. Sevenmile Creek road is another located in the Roosevelt National Forest near the town of Red Feather Lakes. This trail offers a relatively moderate ride through forest valley with bouts of creek crossings and climbs, making it an exciting ride. 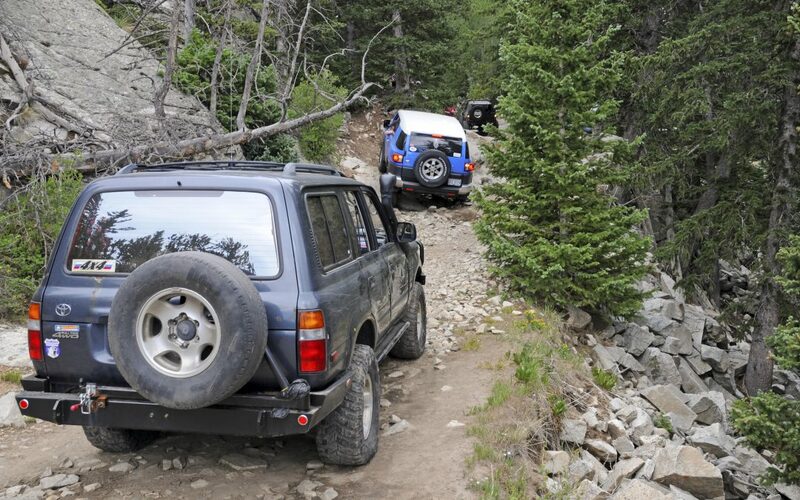 As with most trails, a high-clearance vehicle is best as there may be up to 12″ high rock as well as creek crossings. The trail also offers some obstacles for those more experienced drivers. There’s plenty of camping along the route at the end of spur roads, which makes this spot great for a multi-day trip. Some can hold larger groups but get there early to claim your spot during the more popular seasons. Elkhorn Mountain is one of many difficult trails in northern Colorado that offer exciting challenges and beautiful views. During the autumn months, Aspens create amazing color. Camping sites can be found at both the east and west end of this road, so setting up base camp for a multi-day excursion would make for a great weekend. Being a more difficult road to traverse, 4×4 vehicles with good clearance are necessary. This is also a fun ride for ATV vehicles. Elkhorn Mountain road also has some history to it. The Elkhorn Mine (1870-1900’s) was located in the area and was popular for its silver and gold ore. Though you will see old mining equipment along the route, the buildings are all but ruins. Hanhs Peak is another trail rated difficult due to its rocky nature, narrow passes, and switchbacks. It’s important to take note of directions when on this route as not to get turned around on any of the various old mining trails that pepper the road. Other roads along the way, however, can add to your journey making this an adventurous day of off-roading. The road itself leads toward the top of Hanhs Peak, where a fire tower (which stands upward to 10,000 above sea level) allows for amazing views of Steamboat Lake and the area below. Like many other trails, there is camping in the area. However, Hanhs Peak is just about an hour from Steamboat Springs. So if you’re looking to plan a weekend trip and visit other trails in the area, look into a bed and breakfast or other lodging options in Steamboat Springs. Regardless of the adventure you choose, always be sure to check with the local forest service about current trail conditions and don’t forget to make sure your vehicle is in good working condition.